Ground Name: The LambCapacity: 4,065 (Seated 518)Address: The Lamb Ground, Kettlebrook, Tamworth, Staffs, B77 1AAMain Telephone No: 01827 65798Fax No: 01827 62236Nickname: The LambsYear Ground Opened: 1934Home Kit Colours: Red & WhiteOfficial Web Site: www.thelambs.co.ukAbout The LambAlthough the ground is on the small side, it is well maintained and it has a certain charm about it. 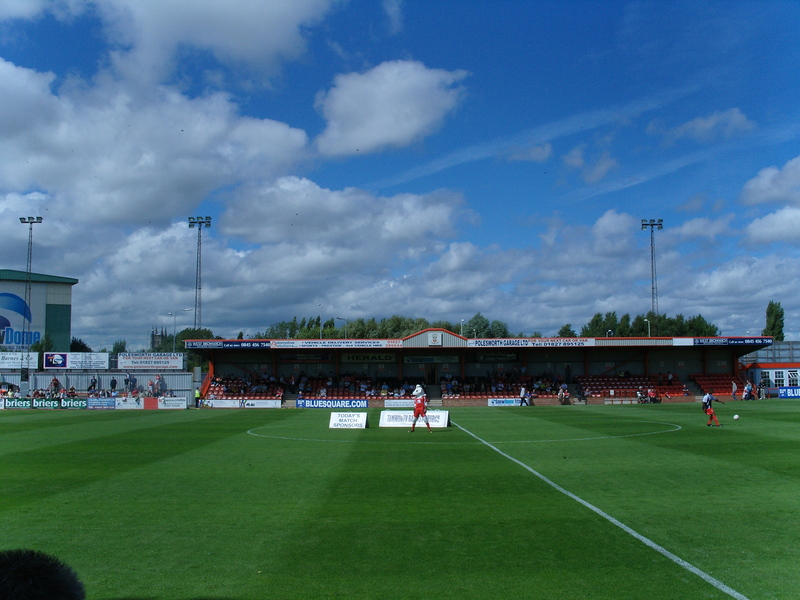 The Main Stand is the most recent addition to the ground, being opened in 1996. It is a tidy little all seated covered stand that straddles the halfway line of the pitch. It has a capacity of 426 seats. The other side is a small covered terrace, known by the fans as ‘The Shed’ which runs nearly the full length of the pitch. 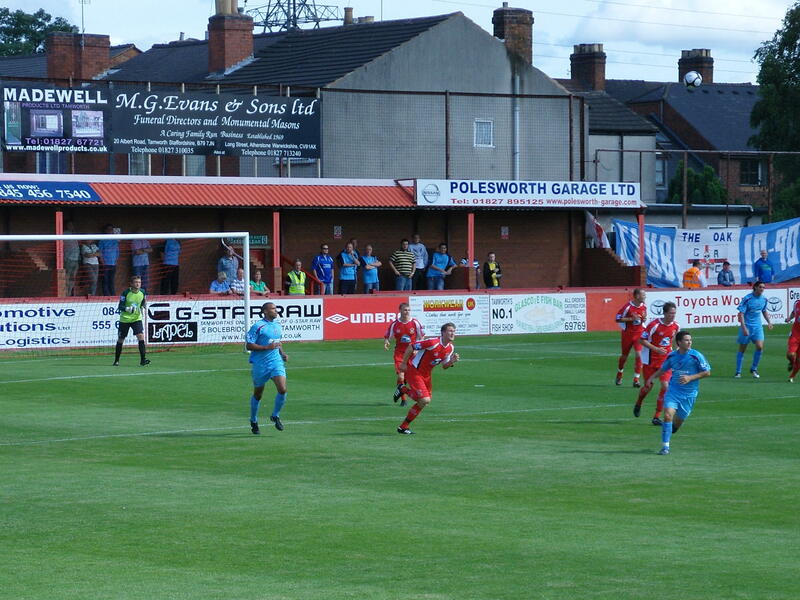 This terrace is home to the ‘The Shed Choir’ (in reference to the Tamworth fans who sing in this stand). On its roof is a television gantry, complete with a large model owl to help deter the presence of other birds. The Castle End is an open terrace, whilst the other end is a partly covered terrace (to the rear). This end, the Meadow Street End, is given to away supporters. The pitch has a slope running up from the Castle End to the Meadow Street Terrace. The ground is overlooked in one corner by the sizeable Tamworth , this season’s shirt sponsors. It gets its unusual name from a former public house called the Lamb Inn that used to be situated near to the entrance to the club car park. There is an excellent club bar in the corner of the ground where you can drink outside when the sun is shining, and has Sky TV.Thanks to Duncan Adam’s and his excellent Football Grounds Guide for the above information.How to get to The LambThe ground is located on the outskirts of the town centre but well placed for local amenities. From the railway station it is a 15 minute walk. Exit the station and walk down to the traffic island. Turn left along the dual carriageway and continue to follow it, bearing around to the left at the next roundabout, which takes you past a garage. The floodlights and the red exterior of the ground can be seen in the distance in front of you. If you are driving you will probably come via the M42. Exit the motorway at junction 10 and take the A5 towards Tamworth. Follow signs for the SnowDome off the A5 – the ground is almost opposite the huge building. You can park at the ground for £1 or street parking for free nearby.How to get a ticket for The LambWith a capacity of over 4,000 and an average attendance of less than 1,000 getting into see a game isnt a hard job. Simply pitch up before the game, pay your £12 for a place on the terrace or £14 for one of the 500 or so seats and you are in (£7 and £9 for concessions respectively). The club occasionally give away concession tickets free of charge via schemes with local shops such as ASDA and McDonalds. Check the official website for details of such events. Our Last Visit – Tamworth 2 Grays Athletic 0 – 15th August 2009Two weeks is the longest I had gone without football for nearly three years. With summer leagues in the Nordics combined with major UEFA tournaments in Holland, Austria, Switzerland and Sweden providing more than a few games to go to I had not been in short supply of a game or two. So since my visit to Cardiff two weeks ago I had thrown myself into my new job, and more importantly, new flat in Copenhagen. I had even chosen to avoid the “mirth” and “mayhem” in Amsterdam as 5,000 England fans with little imagination descended on one of Europe’s over rated cities for the friendly between Holland and England. But fear not dear reader the games are coming thick and fast over the next few weeks. But first it was time for a new ground. Not just any old game either – we are talking about major league stuff here – step forward Tamworth FC and Grays Athletic. Since my last post about Grays (see “A local Team”) the club had gone through a strange few weeks. They had added to the squad (in fact bringing in 15 players in just one week including John Terry’s brother Paul and ex-Luton striker Dean Morgan), sacked their manager (their twelve in just nine seasons) and were all ready for the big kick off at home to Chester City when the FA came a-calling, demanding that the game was called off down to issues around the ownership of the Welsh/English team. So Grays got a day off, starting their campaign against Histon a few days later, gaining a very good scoreless draw. Tamworth had also been due to play Wrexham, but like Grays their game was postponed (for the reason that the Welsh team had a number of players on International duty) as well but they had opened up with a credible draw away to Stevenage Borough. So pretty even really. The Little Fullers had been on their annual pilgrimage up north to their Grandparents and we had to go and pick them up before they started talking some foreign language. As luck would have it I manage to arrange a subtle detour on the way home to take in the delights of Tamworth, home of The Lamb. Now the people of Tamworth must have some real balls. Not happy with their original ground, the Jolly Sailor ground (named after a pub and not a drunk naval character), they moved to The Lamb in 1933 and have called the stadium home since. They had won the Blue Square North league last season, coming out on top of a close bunch of teams including Alfreton Town, AFC Telford United and Gateshead. They had actually played at this level before, having completed two seasons a few years ago. The time at the top level was eventful to say the least. After winning the Southern League in 2003 the club found life tough in the top level of non league football. They also reached the FA Trophy final but surprisingly lost to Burscough at Villa Park. In early 2006, with the team struggling to retain their Conference position they stunned the football world (well in the East Midlands anyway) by announcing that they had signed Paul Merson. Unfortunately time and years of off the field distractions had taken their toll on the ex-Arsenal player and just over a month later, and with only one appearance for the Lamb Merson announced his retirement from football. At the end of the season the club finished in the relegation places, but Canvey Island decided to concentrate on redeveloping their caravan park and so they went down, and Tamworth stayed up. But twelve months later they couldn’t avoid the inevitable and they were relegated to the Conference North. Their exile lasted just twelve months as they won the league last season, not before the fans had won the prestigious “most drunk fans in non-league football” award. With West Ham’s Premier League campaign kicking off on the other side of the West Midlands at Wolverhampton, and Kent’s crusade to be England’s number one Twenty20 side taking place in Birmingham at Edgebaston I was spoilt for choice. However, who needs Premier League or Twenty20 commercialised crap when you can have Blue Square football! Lolly had the option whether to come to the football or go to the cinema for this one. She is growing up fast and faced with the opportunity to dress up and put on make up she inexplicably chose Aliens in the Attic rather than the football. So after depositing the Fuller girls at the Odeon I walked through the maze of tunnels and found myself at The Lamb – probably the best named ground, behind the Dripping Pan, in England. The sun was shining and I managed to have a nice pint outside the social club, located in the corner of the ground as the players warmed up. Today’s match sponsor was the local baptist church, perhaps feeling the club needed some divine intervention. However, the choir were here in full voice behind the dugouts and from the first whistle tried to rouse the home team. 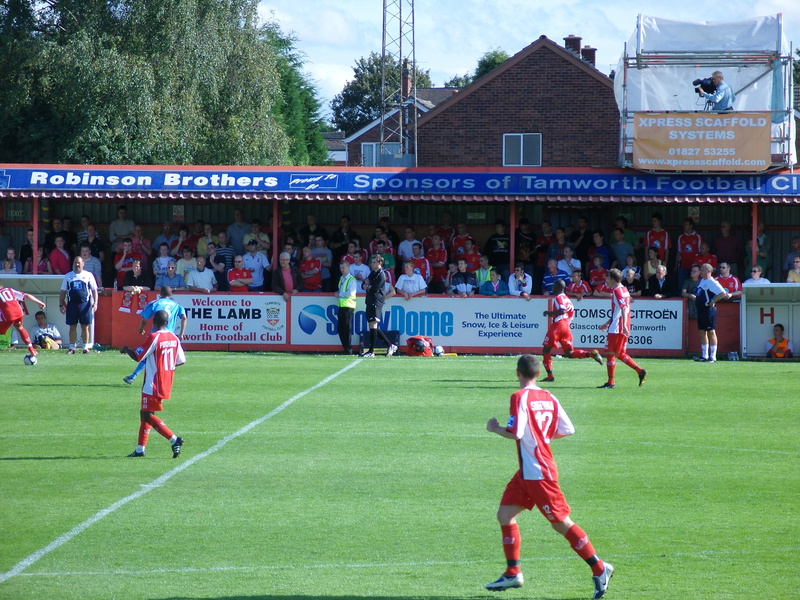 The first ten minutes was relatively open, with Tamworth looking the most positive. Grays looked like a team who hardly knew each other (not really surprising considering the past few weeks) but their innovation of putting the first initial as well as surname on the back of the shirts must have been designed to help them get to know their team mates. They started with Paul Terry in centre midfield and Dean Morgan up front and it was the ex-Luton man who broke the deadlock on 14 minutes when at first he appeared to lose control of the ball, putting the Tamworth defender off guard before stabbing the ball home from 12 yards for the Essex’s teams first goal of the season. Just over five minutes later it was 1-1 as Bradley Pritchard slotted home after Gray failed to clear a dangerous cross into the box and Slade’s “Com feel the noize” boomed out around the ground. One became two in the 25th minute when the Grays defence seemed to go to sleep, their attention diverted by Alex Rodman wandering around the edge of the pitch holding his head and Jake Sheridan drove the ball home from the right hand side of the penalty area just inside the far post. Grays were almost level a few minutes later as Richard Graham’s shot was cleared by Tamworth as it rolled towards an empty net, after Dean Morgan had again shown his class in the penalty area for the visitors. Both teams made changes at the start of the second half, believing that the game was their’s for the taking. Tamworth’s manager, the Ex-Nottingham Forest player Gary Mills, had certainly got them playing some attractive football, with passes finding feet rather than heads and some excellent overlapping from both full backs. Some very questionable offside decisions did not endear the assistant referee to the home fans when time and time again the final forward was flagged for offside despite making his run from behind the last defender. Grays played their part to in an entertaining game, often breaking with pace but just lacking the final ball, especially when Dean Morgan was withdrawn just before the hour mark. The crowd behind the dugout continued their vocal support although they were along way short of the mark when they sung “No one likes us, we don’t care”. Talk like that leads to all sorts of issues in later live, and anyway what was there not to like about a traditional Non-League ground in the summer sunshine. It was a bit disappointing that the official attendance was just under 750 as the club seemed to have made an effort in providing a decent ground, and with things on the up on the pitch they should be rightly proud of their club. I am sure for the bigger games such as the visit of Luton Town or Kidderminster Harriers the sizeable away support will swell the crowd, and the bar takings significantly. Alex Rodman continued to shine for the home team, with one run in particular taking out four Grays players, and then a few minutes later a shot from 25 yards narrowly missing the net proving his emergence as a player to watch this season. Neil MacKenzie should have made the game safe for Tamworth on the 80th minute but somehow Gray’s keeper Edwards got a foot to his goalbound shot. Grays started to lose their discipline as the game wore on and a few tackles were a bit over the top and the yellow card came out on a few occasions. So a great start to the domestic league season. Great little ground, friendly fans, a rare afternoon of sunshine and some decent football. On this showing neither will challenge for the top spots in the Blue Square Premier, but likewise neither will they be fighting for survival at the end of the season – Famous last words Fuller!